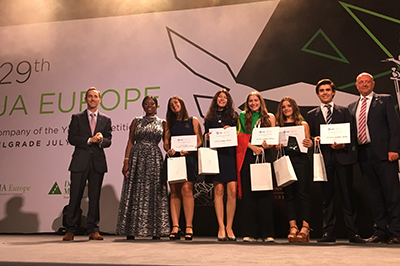 This year 340,000 students enrolled in the JA Company Programme, with 200 taking part in the European competition which gathers national winners from 40 countries across Europe. Since 2013, JA Europe and AT&T have worked together to empower young people with entrepreneurship and employability schemes that help students move into the workforce with a clear competitive advantage. During the academic year 2017-2018, more than 5000 students from 8 countries participated in various activities including masterclasses, innovation camps, job shadow days and hackathons with the support of 300 volunteers. “The world is changing fast and businesses need to constantly adapt to the new norms dictated by technology and digital innovation in telecommunication. The AT&T Excellence in IT Award encourages and recognizes young people’s efforts to focus on digital transformation and explore the opportunities this evolution is bringing to them”. This year’s winner, Portugal’s Extinctus Enterprise, demonstrated a specific social contribution, solving real world challenges using technology. It’s early detection system for forest fires uses sensor technology, wireless data capture and a control platform. This business showed material evidence of a credible partner ecosystem: a supply chain, coding, software, sustainability, and mesh networking technology.